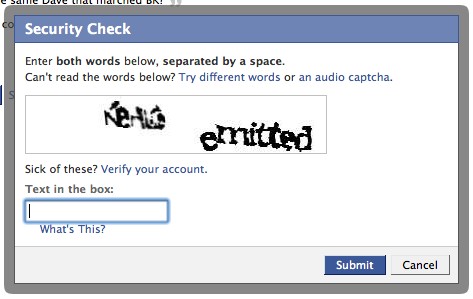 I must not be human as I failed a recaptcha.net request. I like using technology for good purposes and I understand how recaptcha works. The folks at recaptcha.net actually turned it into a service that provides a great deal for the public in that your recaptcha response is used to correct the Optical Character Recognition problems that they had while scanning books to put them online. So, any human readers out there that can solve this one? Admit it, you’re not human either and Carnegie Melon has stolen the last bit of humanity you thought you had.